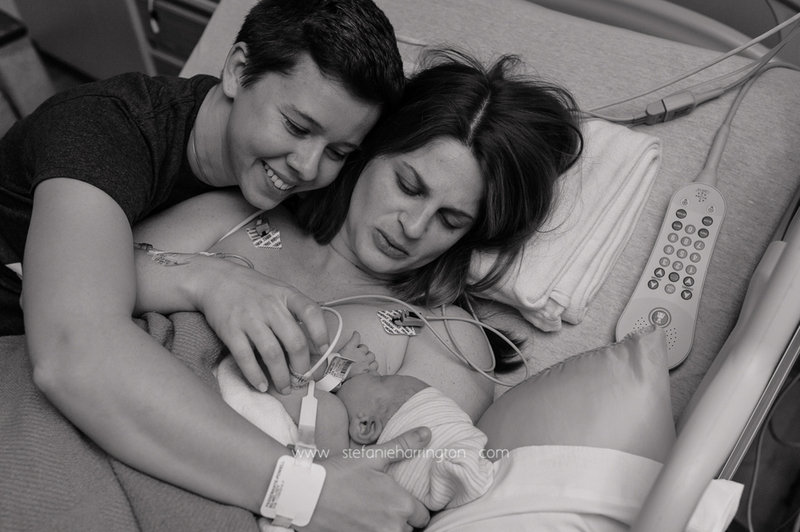 Stefanie shares this birth story on our blog today and shared this why behind her work, "I want to document [the] tears of laughter, the belly laugh, the way your babies fit so perfectly into your arms in this moment in time." She is based in the Washington D.C. area. Each birth story is so unique and amazing. Mom worked hard and patiently to welcome this baby girl into the world with her wife as her wonderful labor support and surrounded by loving family members. Every step of the way to meeting their daughter reflected so much love and determination. A woman in labor is truly awe inspiring each and every time. A quiet excitement settled in as the family waited for a c-section, and I am so honored to have been chosen to tell Berkley’s story. Berkley and her moms were only gone a little while since they didn’t have to wait in recovery, and I loved being a part of the special moment as mom was finally able to hold her daughter for the first time and as the grandparents met their newest love.